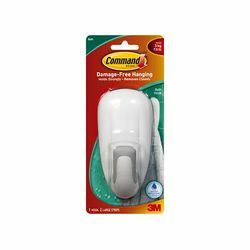 3M 17600B Command Bath Hook White - Micro Parts &amp; Supplies, Inc. The mounting solution that holds firmly and removes cleanly. It leaves no surface damage, creating an easy and affordable way to organize and decorate! Each hook holds up to 7 pounds with 2 strips per pack.